I have a very old ring. The stone is oval. 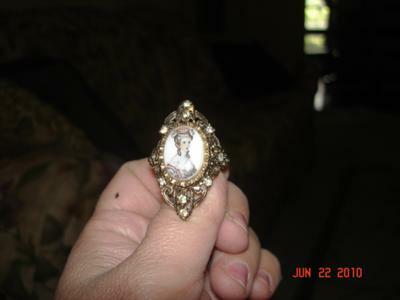 It looks like white marble with a victorian lady on it. The ring is gold, itself, but there are rhinestones in strategic places on it. On the inside of the band, there is a U with an arrow through it or it could be an N with an arrow through it depending on which way you look at it. Or could it be a horseshoe. Do you have any thoughts on this ring. Thank you.